I don’t remember whether I was on the super slab or if I was on a side road, but I was travelling behind a clean looking dump truck. 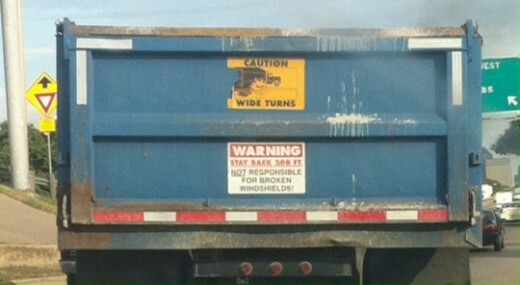 I was up close enough to clearly read the neat block-lettered sign on the back of his dump bed: Warning Stay Back 200 Feet. Not Responsible for broken glass. As I thought about how clean the truck looked and bemused the fact of why they put that sign on the back, I suddenly heard a loud “Whap!” I instantly knew it was the sound of a rock hitting the windshield and cracking it. I looked in the direction of the hit and sure enough, there was the small star of a crack. My reaction was, “Well I’ll be! Here I was just sitting here thinking about what that sign said, and the very thing happens to me!” We must do more than just sit there and read the sign if we are going to keep from getting hit by the rocks of life. As soon as we read the sign, we had better take some evasive action. To delay is to make ourselves more liable to take a hit. Lot was told that the city he was living in was going to be destroyed. He got up and went out to tell his son’s in laws to get out of the city, that it was about to be destroyed. They thought he was joking. They did not take the word that was given to them seriously. I am sure they sat around and talked about Lot among themselves, laughing at the message he was giving them. Even Lot, on the morning of the great destruction dilly-dallied around so that the angels had to grab him and his family by the hand and literally drag them out, the Lord being merciful to them. So they were brought out of the city and the Lord rained fire and brimstone down on Sodom and Gomorrah destroying everyone and everything in the corrupted place. Even after all that, Lot’s wife looked back and became a pillar of salt (Genesis 19). Life and eternity is no joke. Jesus is the sign that is given to us to experience abundant life now and for all eternity. If we sit there and just read the sign and muse on its meaning and we never commit our lives to him to allow him to give us his life and guide us in his way, then we open ourselves to eternal destruction. You don’t want that rock to hit your glass. With the sign given, quickly turn your life to Jesus and obey what his Word says to do. Ask to be filled with and led by his Spirit. As we are quick to follow his way, he will take us by the hand and lead us out of the place of corruption and destruction and bring us into a place of present and eternal peace and rest.